Wow, you guys. Just wow. This is how you write a sequel. Okay, now I have to admit, I was a little hesitant starting Deception. I read the first book Defiance a year ago and gave it five stars, and in the past year my ratings/reviews have gotten a little more critical. So I wasn't sure if I'd love Deception as much as I'd loved Defiance a year ago. 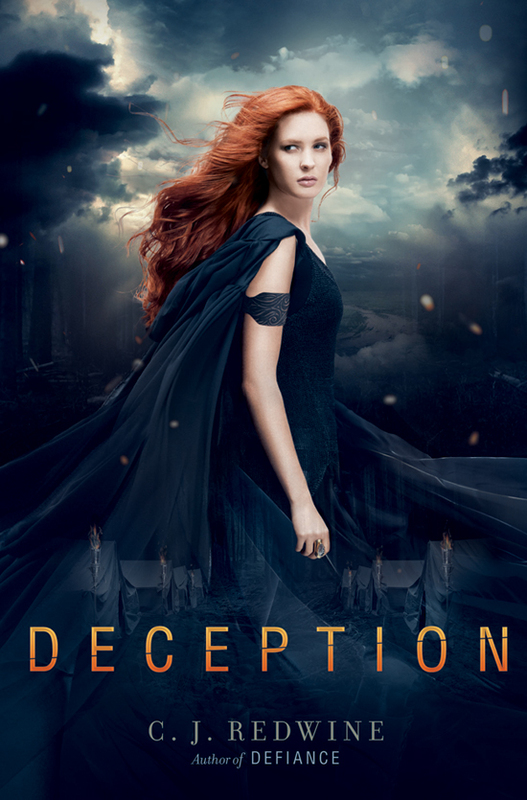 But, I'm happy to say, Deception absolutely deserves five stars. I was completely blown away by how much I loved it. Deception gave me a serious book hangover. I blew through the nearly 500-page book in two days. It's literally unputdownable, and it ends with one of the worst cliffhangers ever. I. Am. Dying. I need the third book! There were so many amazing twists and turns. I was constantly second-guessing everything that happened. The plot is mindblowing, and the action never seems to cease. I can't praise the plot enough - it drew me in so much! Some have complained about the world-building, but it does improve in Deception. I'd say this series is dystopian, with a fantasy feel and some sci-fi elements thrown in. Whatever you want to call this genre, I love it! It's really inventive compared to your average fantasy or dystopian. And it was nice to hear a little backstory mentioned here and there in Deception. Oh man...I love these characters so much. Rachel and Logan are both such fantastically developed characters, both on their own and as a couple. I love how, while the romance between them is present, there's always much more action than romance happening. My heart broke for both of them: Logan and the weight he carries as he becomes the leader, and Rachel and her inner struggles and desires for revenge. Seriously great character development. Oh, and lots of minor characters die. Just a warning. Be prepared for bucket loads of tears. Any criticisms I have are minor: the alternating POVs in each chapter occasionally threw me, and I'd read a couple paragraphs before realizing it was a different character's POV. (But, it should be said, that was likely because I was reading it so quickly I didn't pay close enough attention. ;) The betrayal of a certain character is one you kind of see coming, but there are many suspects and there are still so many other twists, it's not a big deal if you guess it. And sometimes the Commander seems evil simply for the sake of being evil, but I still have to say he's one of the cruelest and scariest villains I've ever read about. Something about him just totally creeps me out, haha. Would I recommend Deception? Absolutely! It's a very riveting and unique read. If you haven't started this series yet, you're missing out on some great YA fiction! I'm crossing my fingers that we don't have a long wait for book three!